Download our weekly newsletter, The Message, in PDF format. Come support our Religious School Students who will be participating in Friday night services on Friday, April 12 th. A child friendly Oneg will follow services. The Oneg has been graciously under written by Robbie and Amy Morris. Lots of Fun! Tease your brain! Snacks ! Join us for an optional dinner out after Trivia. 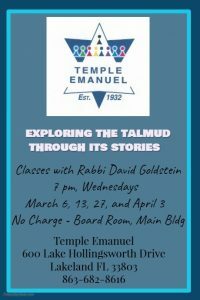 Join Rabbi Goldstein as he explores selected Talmud Tales helping us gain an understanding of the human dimensions of the text along with a goal of incorporating their values in our own lives. The Religious School will be participating in Friday night services. We will not have a congregation Shabbat dinner on April 12th. Menu: Israeli Salad, Matzo Ball Soup, Homemade Gefilte Fish, Brisket, Herb Rotisserie Chicken, Apricot Carrot Tzimmes, Potato Kugel, and Desserts. Note: Vegetarian option available—Must be preordered in advance of the seder only - contact the Temple office with your request. Thursday, April 4th 6:00 pm.—Curator Tour with Dr. Alex Rich. 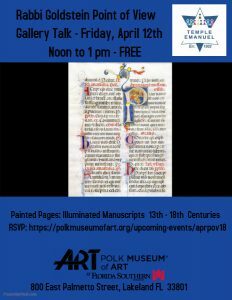 Dr Rich will give a tour of the Painted Pages: Illuminated Manuscripts 13th - 18th Century exhibit. Following Dr. Rich’s tour, Rabbi Goldstein will present a workshop at 7 pm on Writing Like a Sofer (Scribe). Friday, April 12th 12:00—1:00 pm - Point Of View Gallery Talk with Rabbi David Goldstein. Rabbi will discuss works from Painted Pages: Illuminated Manuscripts 13th - 18th Century. 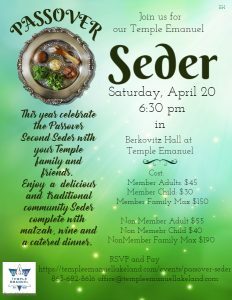 Temple Second Passover Seder - Make your reservations now!! The March 27th class has been rescheduled to April 10th. Join a team or bring your own and test your brain on some fun general knowledge Trivia. We will have 3 rounds and PRIZES! Snacks provided, but we will accept donations to cover the cost. 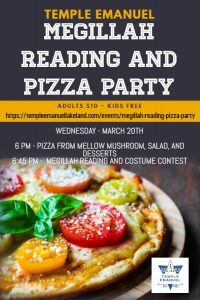 6:45 p.m. Megillah Reading and Costume Contest Prizes for kids and adults. Our next Shabbat Service Away will be Friday, March 22nd at 7:30 p.m. Call the Temple office (863) 682-8616 or Tammy Serebrin (863) 838-2583 for location and parking information . Topic: The current situation in the middle east. The Religious School will be participating in Friday night services this evening. Shabbat Dinner 6:00 p.m. Shabbat Services 7:00 p.m. There is no charge for our religious school teachers, students and their parents. The cost for our Religious School attendees has been graciously under written by Julie Stern and Rich Wills. The cost for non-members and congregants without children in the religious school will be: Adults - $12.00 Children under 13 - $6.00 Family Max (for congregants) $36.00 RSVP online @ https://templeemanuellakeland.com/events/religious-school-shabbats/ ******** Megillah Reading and Pizza Party Wednesday, March 20th Berkovitz Hall 6:00 p.m. Pizza, Salads, and Dessert 6:45 p.m. Megillah Reading and Costume Contest Prizes for kids and adults $ 10.00 - Adults No charge for children RSVP and pay online @ https://templeemanuellakeland.com/events/megillah-reading-pizza-party ******** Family Trivia - Sunday, March 10th 4p.m. 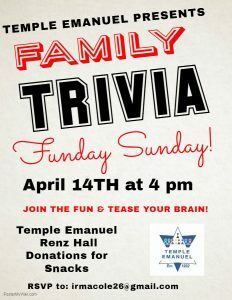 Berkovitz Hall Join a team or bring your own and test your brain on some fun general knowledge Trivia. We will have 3 rounds and PRIZES! Snacks provided but we will pass a basket for donations to cover the cost. We will have an optional dinner out afterwards. Let's just get together! Appropriate for teens and adults. RSVP to irmacole26@gmail.com ******** Community Events B'nai Brith Brunch Sunday, March 17th, 10:00 a.m. Cleveland Height Golf Course Speaker: Dr. John Santosuosso, Professor Emeritus of Political Science at FSC. Topic: Current situation in the Middle East. Dr. Santosuosso is known for his ability to describe the political situation in the Middle East in an unbiased manner. The Talmud contains hundreds of stories about rabbinic sages and other historical figures who lived during the late second temple and rabbinic periods. The stories are literary rather than historical accounts. We will be exploring selected Talmud Tales to gain an understanding of the human dimensions of the text along with a goal of incorporating their values in our own lives. Rabbi David Goldstein will be teaching this class. Classes will be held on Wednesday evenings at 7pm March 6 , 13, 27 and conclude on April 3 - Signer Board Room - No Charge (Flyer attached) ******** Family Trivia Sunday, March 10th 4pm Berkovitz Hall Join a team or bring your own and test your brain on some fun general knowledge Trivia. We will have 3 rounds and PRIZES! Snacks provided but we will pass a basket for donations to cover the cost. Should only be a few hours and if anyone wants to go out to eat afterwards we can figure that out. Let's just get together! Appropriate for teens and adults. (Flyer attached) RSVP to irmacole26@gmail.com ******** Religious School Shabbat and Congregation Shabbat Dinner Our Religious School students will be participating in Friday night services on Friday, March 8th. Preceding the service we will have a congregation Shabbat dinner. Shabbat Dinner 6:00 p.m. Shabbat Services 7:00 p.m. There is no charge for our religious school teachers, students and their parents. 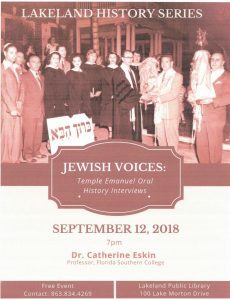 The cost for our Religious School attendees has been graciously under written by Julie Stern and Rich Wills The cost for non-members and congregants without children in the religious school will be: Adults - $12.00 Children under 13 - $6.00 Family Max (for congregants) $36.00 RSVP online @ https://templeemanuellakeland.com/events/religious-school-shabbats/ ******** Yom Hashoah Guest Speaker Rose Rosenkranz, a child survivor of the holocaust and Regional Director of March of the Living will tell her compelling story on Wednesday, May 1st at 7:00 p.m. Berkovitz Hall. Dessert reception to follow the program. The program is free but we are collecting donations for scholarships for teens to go on the March of the Living https://www.paypal.com/cgi-bin/webscr?cmd=_s-xclick&hosted_button_id=TZYLJ7TC333VA&source=url (Flyer attached) ******** Community Events: Florida Philharmonia, a volunteer Lakeland based orchestra is giving a free concert at 7:30 p.m. on Tuesday, March 5. Two Temple members are playing in this concert - Joan Torbett on flute and Norma Jo Vaillette on violin. The concert is at College Heights United Methodist Church at 942 South Blvd., Lakeland. ( better to arrive early due to parking and seating) Free parking, free concert (donations accepted). Classical program: Brahms, Stravinsky, Dvorak, Smetana, Vaughan Williams. Let's support our Temple members in their community endeavors! Shabbat Away Service Friday, February 22nd 7:30 p.m.
Join us tonight for our monthly Shabbat Away Service. Call the Temple Office (863) 682-8616 or Tammy Serebrin at (863) 838-2583 for location and parking information. NOTE: There will not be a service at the Temple on Friday, February 22nd. Shabbat morning services on Saturday, February 23rd will be held in Renz Hall. Religious School Shabbat Service and Congregation Shabbat Dinner Friday, March 8th. The Religious School will be participating in Friday night services. Shabbat Dinner 6:00 p.m. Shabbat Services 7:00 p.m.
Wednesday, May 1st 7:00 pm, Berkovitz Hall. Dessert reception to follow the program. We are seeking a Temple member to host our next Shabbat Away service on Friday, February 22nd. The Temple will provide everything needed for the service, food for the Oneg, and help with setup / cleanup. Please let Allen Shane or Rabbi Goldstein know if you would be able to host the service in your home. Religious School Shabbat - Tonight - Friday, February 8th The service will start at 7:00 p.m. in the Education Building. Following the service there will be a child friendly Oneg Shabbat. We will not have a Shabbat dinner. Join us and support our Religious School students as they participate in Friday evening Shabbat Services. Book Club - Tuesday, February 5 at 11 am, followed by an optional lunch out. The book selection is “The Paris Architect” by Charles Belfoure. Note: The Book Club will be meeting in the library at the Temple. The book is available through amazon in Kindle and paperback. Religious School Shabbat and Oneg The Religious School will be participating in Friday night services on Friday, February 8th. Services will begin at 7:00 pm. in the Education Building. A child-friendly oneg shabbat will follow the service. The Oneg Shabbat has been graciously sponsored by Robbie and Amy Morris. 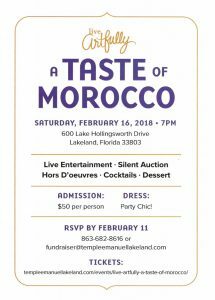 ******** Live Artfully: A Taste of Morocco Saturday, February 16, 2019 7:00 pm Live Entertainment ** Hors D'oeuvres ** Silent Auction ** Cocktails ** Dessert Have you bought your tickets yet for our upcoming fundraiser? Jodie and her team are hard at work getting ready for the big night. Please support our volunteers and the temple. Get your tickets now at: https://templeemanuellakeland.com/events/live-artfully-a-taste-of-morocco/ ******** Valentine's Day Shopping Shop for all your Valentine’s Day gifts at smile.amazon.com/ch/59-0915228 and AmazonSmile donates to Temple Emanuel. 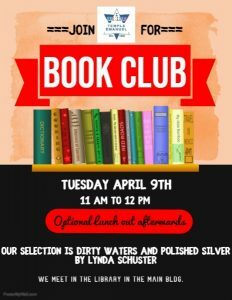 Book Club - Thursday, February 5th 11:00 am, followed by an optional lunch out. Note: The Book Club meeting will be held in the Temple library in the main building. Shabbat Service away from home will be tonight, Friday, January 18th at 7:30 p.m. Contact the Temple Office (863) 682-8616, Tammy Serebrin (863) 838-2583 or Allen Shane (863) 604-0767 for the location and directions. We will not be publicizing the location in The Message, Facebook or on the website to maintain security for the members hosting the service. Note: There will not be a Friday evening service at the temple on Friday, January 18th. Shabbat morning services on Saturday, January 19th be in Renz Hall. Sponsors - If you have agreed to be a sponsor for the fundraiser, we thank you. The committee would greatly appreciate your completing and mailing your check and sponsorship form in, if you have not already submitted it. Thank you for your support of Temple Emanuel. Community Events: B'nai Brith Brunch - Sunday, January 20th 10am Cleveland Height Golf Course. Speaker: Mark Scolnick will be speaking on SCORE: Helping Businesses Grow. The Religious School will be participating in Friday night services on Friday, January 11th. Shabbat Dinner at 6:00 pm.Services will begin at 7:00 pm. There is no charge for our religious school teachers, students and their parents. The cost for our Religious School attendees has been graciously under written by David and Shelley Robinson. Our next Shabbat Service away from home will be on Friday, January 18th at 7:30 p.m. Contact the Temple Office (863) 682-8616, Tammy Serebrin (863) 838-2583 or Allen Shane (863) 604-0767 for the location and directions. 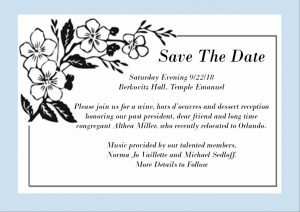 Save the Date for the Temple Emanuel annual fundraiser. This time we take a journey to Morocco! Great food and fun! You can make your reservations now for 2/16/19. Only $50 per person. Just click on the ticket link. 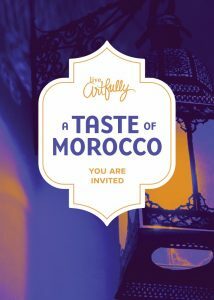 https://templeemanuellakeland.com/events/live-artfully-a-taste-of-morocco/Thanks! See you there! Shabbat Away From Home - Our Shabbat Service away from home will be tonight, Friday, December 21st at 7:30 p.m. Contact the Temple Office (863) 682-8616, or Tammy Serebrin (863) 838-2583 for the location and directions. We will not be publicizing the location in The Message, Facebook or on the website to maintain security for the members hosting the service. We will not have a service at the Temple. Shabbat Morning services on Saturday, December 22nd will be held in Renz Hall in the Education building. Drone Needed - Do you have a drone, or know someone that does? Holiday Shopping - Wrap up your holiday shopping at smile.amazon.com/ch/59-0915228 and AmazonSmile donates to Temple Emanuel. This is really easy to do and does not cost you a thing. Please share. Ask your family and friends to use our link or make Temple Emanuel their non-profit choice. Thanks! When you Shop at AmazonSmile, Amazon will donate to Temple Emanuel, support us every time you shop. Due to circumstances, the religious school Shabbat service and congregation Shabbat dinner scheduled for this evening has been cancelled. Anyone who has paid for dinner will have their payment applied to the next meal they attend. Services will take place at the regular time , 7:30 p.m. in Renz Hall on 12/14. The next Religious school Shabbat and Shabbat dinner will take place on January 11, 2019. ******** Shabbat Away From Home Our next Shabbat Service away from home will be next Friday, December 21st at 7:30 p.m. Contact the Temple Office (863) 682-8616, Tammy Serebrin (863) 838-2583 or Allen Shane (863) 604-0767 for the location and directions. We will not be publicizing the location in The Message, Facebook or on the website to maintain security for the members hosting the service. We will not have a service at the Temple on December 21st. Shabbat morning services on December 22nd will be held in Renz Hall at the Temple. ***************** Curator Tour of the Chagall Exhibit A special curator tour of the amazing Chagall Exhibit, by Dr. Alex Rich will take place at the Polk Museum of Art on Sunday December 16 from 1:00 p.m. until 2:30 p.m. for the Jewish Community and friends. There is room for 18 more people to sign on to this tour. There is no charge. If the 1:00 p.m. tour fills up they will schedule another one from 3:00 p.m. until 4:30 p.m. Please respond by email ASAP if you would like to join the tour and support Polk Museum of Art's wonderful effort to bring a famous Jewish artist exhibit to the museum. Message 181208 Please note that the Religious School Shabbat Dinner and Service for December 14th has been cancelled. Regular Friday Services will be held at 7:30 though so please plan to attend. Shabbat Dinner at 6:00 p.m. The Religious School students will be participating in Friday night Shabbat services. Services begin at 7:00 p.m. Preceding the service will be a Shabbat Dinner. There is no charge for our Religious School Teachers, Students, and their parents. The cost for the Religious School attendees has been graciously under written by David and Shelley Robinson. Our next Book Club meeting will be Tuesday, 12/4/18 at 11am in the Media Center of our Education Building, followed by an optional lunch out. The book club selection is “The Strange Case of Dr. Couney: How a Mysterious European Showman Saved Thousands of American Babies” by Dawn Raffel. It is available from Amazon on Kindle, and in used and new book form. Please donate to the Temple Emanuel Giving Tuesday Fundraiser to help us purchase tablets for our Religious School students. Facebook and PayPal will be matching donations on Giving Tuesday. Message 181117 Read details about upcoming Religious School Shabbat Dinner and Service on Dec. 14th and Giving Tuesday inside this week's update! 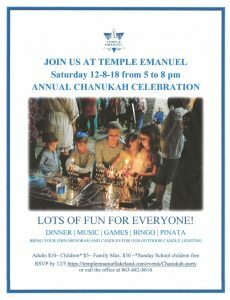 Make your reservations for Chanukah below. Chanukah Party December 8th, 5-8 p.m.
We will have a short Havdalah Service followed by a full dinner with lot’s of latkes ! Outdoor candle lighting. Bring your menorahs and candles. Games and prizes! Bring your friends! Come enjoy a delicious dinner and support or Religious School Students as they participate in services. No charge for Religious School Students, Parents and Teacher. The cost for our Religious School attendees has been generously underwritten by Michael and Nyrka Riskin. 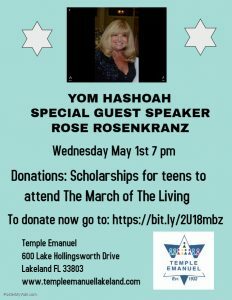 Marie Eisen is sponsoring and dedicating the Oneg Shabbat in celebration of the blessed arrival of her now two month old granddaughter, Annie, who lives in Michigan. Mazel tov to Grandma Marie. Our Friday Evening Shabbat Services, next week will be held at the home of Marilyn Signer, 5615 Lakeland Highlands Road, Lakeland, Florida. Bake pumpkin bread / muffins to be included with their Thanksgiving meals. Bring all baked goods to the Temple by Friday 11/16. Donate seasonal non perishable foods for their supplemental grocery program. (Instant potatoes, stuffing mix, canned goods (green beans, corn, cranberry sauce, and cream of mushroom soup). Bring all food donations to the Temple by Friday 11/16. Snap Green Beans — Monday, November 19th at 10 am Room A at First Presbyterian Church. Come help us snap beans for their Thanksgiving dinner. Thanksgiving Meals delivery - Help deliver meals on Wednesday, November 21st. Pick up the meals at RP Funding Center from 3:00 - 5:30 pm. Entrance 2 on the NW side of the complex. Temple Emanuel, along with United Synagogue, United Jewish Communities, and the ADL encourage everyone to Show Up for Shabbat, this weekend as we stand to remember the 11 Jews that were killed.and show the world that community, love, and good triumphs over evil. Wherever you may be, attend services and join the with the community as they Stand Up For Pittsburgh. We invite our non-Jewish friends to join with us for services. Friday evening services begin at 7:30 p.m. Saturday morning services begin at 9:30 a.m. we ask our friends to please contact the Temple office and let us know you will be attending. We will have Sheriff's Department security present on the property. To Show support for the exhibit Temple Emanuel is sponsoring the Salon on November 5, 2018 1-2:30 p.m.. You will enjoy an in depth tour of Chagall's works led by Dr. Alex Rich, Polk Museum Curator and Director of Galleries and Exhibits. Cost is $40.00 per person. Space is limited to 40 women. Shabbat Services will be held at Renz Hall in the Education Building. Marc Chagall Salon Exhibit - Chagall - Stories into Dreams - November 5, 2018 1:00 p.m. Polk Museum of Art. $40.00 per person. Temple Emanuel is sponsoring the Salon for Women. B'nai Brith Meeting - Sunday, October 21, 2018 10:00 Cleveland Heights Golf Club. Please RSVP now if you plan to attend and have not replied. TOPIC: Inspiring talk on how Hundreds of Thousands of Jews were saved from the Holocaust by Christians and Muslim in Europe and Asia. Temple Emanuel expresses sincere condolences to the family of longtime member Gene Trachtenbarg, who passed away on October 10, 2018 at the age of 98. May his memory be for a blessing. The Oneg Shabbat following Friday Evening services is being sponsored by Kathy and Allen Shane in honor of Tammy Serebrin's Birthday. Please come and wish Tammy a Happy Birthday. The next meeting of the book club will be help on Tuesday, October 16th in the Media Center of the Education Building. You can pay at the picnic with cash or check payable to Temple Emanuel. Shabbat Services this week and Yom Kippur Services will be held in Berkovitz Hall. Shabbat Services next weekend - September 21st and 22nd, will be held in the Signer Board Room. Kever Avot Service - Sunday September 16th -11:00 a.m. It is a Jewish custom to visit the graves of our loved ones during the High Holiday season. Temple Emanuel welcomes the Jewish community to attend our annual memorial service, officiated by Rabbi David Goldstein, as we honor our loved ones. This year’s Break the Fast is sponsored by Gerald and Joan Rabin and their son, Gary, in memory of Gerald’s parents, Russell and Nettie Rabin and Joan’s parents, Leonard and Rose Alper. May their memories be for a Blessing. The deadline to RSVP is Sunday, September 16th. Email the temple office at office@templeemanuellakeland.com. Yom Kippur Service Schedule - Please refer to the first page of The Message for the Yom Kippur service schedule. Shabbat Shalom Everyone! Here is your weekly update. Please note that all services for Shabbat and the High Holy Days will be held in Berkovitz Hall. Please refer to the first page of The Message for Rosh Hashanah service times. All services this weekend will be held in the Signer Board Room, due to air conditioning maintenance in Berkovitz Hall. Selichot Service - Join us on Saturday, September 1st as we usher in the beginning of the High Holy Day season with a Havdalah Service, Dessert Reception and Selichot service. Signer Board Room 8:30 p.m. Havdalah / Dessert Reception, 9:30 p.m Selichot. Sunday School will begin on Sunday, August 26 th at 9:30 a.m.
Hebrew School will begin on Tuesday, August 28th at 3:30 p.m. and Wednesday, August 29th at 4:30 p.m. Message 180804 Highlights this week: Summer Jewish Film Festival - Sunday August 5th 4:00 P.M. Cost: $5.00 at the door Optional dinner out afterwards. Film: "Snow in August" ************************ Shabbat Dinner and Services - Friday August 17th. Dinner 6:15 p.m. Services 7:30 p.m. We will recognize our Committee Chairs and volunteers. Cost of Dinner: $12.00 adults, $6.00 children 3-12 years. Call the Temple Office at (863) 682-8616 with any questions. Book selection " Code Girls: The Untold Story of the American Women Code Breakers of World War II. August 5th - "Snow in August"
Shabbat Dinner, Installation of Officers and Awards - Friday, July 27th at 6:15 p.m. Cost of Dinner: $12.00 adults, $6.00 children 3-12 years. Please RSVP by July 23rd so we will have an accurate number to prepare for. Reception honoring Althea Miller - Save the Date - Saturday Evening 9/22/18. Please join us for a wine, hors d’oeuvres and dessert reception honoring our past president, dear friend and long time congregant Althea Miller, who recently relocated to Orlando. Music provided by our talented members, Norma Jo Vaillette and Michael Sedloff. More Details to follow. Shabbat Dinner, Installation of Officers and Awards presentation on Friday July 27th at 6:15 p.m.
https://templeemanuellakeland.com/events/installation-awards-shabbat-dinner/ Please RSVP by July 23rd so we will have an accurate number to prepare for. Rabbi Goldstein will on vacation July 1st until 11th. If a need arises in Rabbi Goldstein’s absence please contact Allen Shane at (863) 604-0767 or the Temple office at (863) 682-8616. and we will assist you. Rabbi Goldstein has made arrangements for us to contact an Orlando area Spiritual Leader, while he is away. Shabbat Services on Friday July 6th will be led by Mavra Kear. Please join us for a lovely Shabbat service led by Mavra. Shabbat Morning Services on Saturday July 7th will be led by Dr. Daniel Leviten. Sundays - July 8, 15, 29 and August 5. 4:00 P.M. Cost: $5.00 at the door Optional dinner out afterwards. There will be a short live concert of Bernstein's compositions preceding the showing of the movie. 12 Wednesdays beginning May 23, 2018, 7:00 p.m.— 8:30 p.m. This is the first in a series of classes taught by Rabbi Goldstein for those seeking to convert to Judaism but anyone wishing to attend is welcome. Please join Temple Emanuel as we celebrate the 70th Anniversary of Israel’s Independence on Saturday evening, May 5, 2018, in the Social Hall at Temple Emanuel Lakeland FL. Our event will begin at 6:45 pmwith an appetizer and dessert reception followed by a program featuring Rabbi-Cantor Joel Fox and Rabbi David Goldstein speaking about their experiences in Israel. Please join Temple Emanuel as we celebrate the 70th Anniversary of Israel’s Independence on Saturday evening, May 5, 2018, in the Social Hall at Temple Emanuel Lakeland FL. Our event will begin at 6:45 pm with an appetizer and dessert reception followed by a program featuring Rabbi-Cantor Joel Fox and Rabbi David Goldstein speaking about their experiences in Israel. A Concert of Israeli Music performed by Rabbi-Cantor Joel Fox will be presented and our evening concludes with a Havdalah Service, a ceremony marking the end of the Sabbath. If you would like to attend, please fill in your details on the form at the link below and you will be automatically registered. Seating is limited. Event registration must be completed at least 2 days prior to the event. Thanks and we look forward to seeing you there! Or you may call the Temple office at (863) 682-8616 and leave a message that you are coming. Our April 15th program has been rescheduled to May 5th. The May 5th program / concert will start at 6:45pm. We will have a dessert reception. Rabbi Goldstein and Rabbi Fox will present an Israeli program. Then Rabbi Fox will perform a concert to celebrate Israel’s anniversary.. We will then end with Havdallah. Open House and Shabbat Service - Rabbi Goldstein would like to invite the congregation to an Open House on the last night of Passover. He has finished his indoor remodeling projects and wants to share with his Temple Family. There will be a Shabbat Service at his home on Friday, April 6th, at 7:30 pm. No service at the synagogue that night. Please see details in The Message for directions. Join us Wednesday Evening, February 28th at 7p.m. for our Purim Celebration and Megillah reading. 7 p.m. in Renz Hall. Come in costume (or not). ** Celebrate the Holiday ** FUN !! Purim Carnival - Sunday March 4th 11 a.m. Kids, Parents, Friends, and the entire congregation is encouraged to come enjoy the fun !! Taste of Spain - Our annual fundraiser will be Saturday evening at 7 p.m. in Berkovitz Hall. Second Night Seder - We are having a Second Night Passover Seder on Saturday, March 31st at 7 p.m. in Berkovitz Hall. Save the date !! Oneg Shabbat - Marilyn Signer is sponsoring the Oneg Shabbat on Friday, February 9th in honor of her grandson, Greg Signer and his bride to be, Lynn Samuels who would be delighted to meet members and friends of Temple Emanuel. Movie Night - Tuesday February 13th at 6:30 p.m. - The movie selection is "Dough" We will have a light dinner before the movie. Bnai Brith Meeting - Sunday, February 18th. Cleveland Heights Golf Club. Dr. Glen Barden is the speaker. Join us for Tot Shabbat tonight at 6:30 followed by regular Friday night Shabbat service and oneg. Oneg Shabbat tonight, Friday 1.19.18 - Jane and Brian Renz will be sponsoring the Oneg Shabbat in honor of their son Jeffrey Renz, his wife Irene Blazquez and daughter Jessica Renz who are visiting with us from New York City. Please come join them at services. Bnai Brith Meeting Sunday January 21st, 10 am to noon at Cleveland Heights. Barry Friedman will be speaking on “How fake news got started and news media trends". Israel Independence Day planning meeting Monday, January 22nd, 7 pm in Berkovitz Hall - to plan our Israel Independence Day Celebration for April 15th. We need volunteers and your input and ideas. Chocolate Oneg - We are having a chocolate seder in honor of Tu'Bshvat next Friday after services. It will be enjoyable for the whole family. Oneg Shabbat January 19th. - The Oneg Shabbat next Friday evening will sponsored by Jane and Brian Renz in honor of their children who will be visiting from NY. 1. Mazel Tov to Daniel Leviten on his retirement after 40 years in practice as a pediatrician. 2. Tribute Dinner Honoring Marvin Wyman - January 14th 5:30 p.m. Please RSVP and pay online at https://templeemanuellakeland.com/events/marvin-wyman-tribute-dinner/ by January 8th. 3. End of the year donations - there is still time to make any payments for dues, the fundraiser, or other donation by December 31st online at https://templeemanuellakeland.com. Click on the donate button. 4. Rabbi Goldstein Vacation - Rabbi Goldstein will be on vacation from Saturday, December 30th (after Shabbat services) until Thursday, January 11th. If you need a Rabbi for an emergency during Rabbi Goldstein's absence please call Allen Shane at (863) 604-0767 or leave a message at the Temple office (863) 682-8616. 5. Tot Shabbat January 5th has been cancelled. We wish all of our Temple members and friends a very Happy and Health New Year.